We came across some old pictures that I thought some might find interesting. The first one is a 1975 31' and 1976 Pontiac Bonneville, I drove this combinaton to Florida my self when I was 17 following dad who was towing his partners trailer down for him with his Mark 5 Lincoln. The second shot my father cooking breakfast at an Airstream rally at the store in 72 or 73. See the new Airstreams parked in the building around him. The third shot is a trip to our first international rally in Wyoming in 1969 the trailer is a 1965 30' and the tow vehicle a 1966 Chrysler with a 383. The fourth is of a 1985 Chev Caprice modified for towing on display at an Rv show at the Metro Toronto Convention Centre. This is our second front drive tow vehicle, a 1988 Oldsmobile with a 3.8 Litre V/6 on a trip to NewFoundland. The second is 1977 Camaro connected to a 1978 23' at the London RV show in 1978. This was a lot of fun to tow with and really openend our eyes tow how much stabilty you could get with a tight handling suspension. It would not be great by today's standards but at the time it felt like it was on rails compared with anything else you could buy. Thanks. I wish I had more pics of parents Silver Streak hooked up to one or more '70's Cadillacs and grandparents Streamline hooked up to police-spec '68 Dodge Monaco. Andy... thnxs for taking the time to post the pics. Really cool!!! 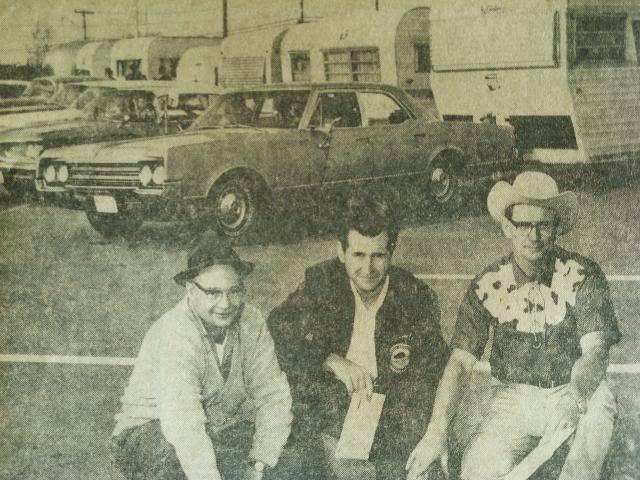 Back in the mid 60's my Dad started a trailer club in St. Catharine's ONT which soon grew to 50 trailers. 49SOB's and 1 Airstream owned by Jake Dyck. Back then (60's and 70's) the Dyck's bought 3 Airstreams from you and your Dad. A Caravel, Bambi, and then a 27 International. They towed with a 1965 Plymouth Fury 383 for many years. I recall Jake leaving the parking lot the day the pic was taken. With the Airstream in tow the 383 spun the back tires on dry pavement when he started moving. You can see the Airstream in the top left corner of the pic. Thanks for sharing...love your Dad's Leisure Suit. A great idea for a vintage rally. The Olds and Chevy Camaro are both rear wheel drive, or did I read your " front drive" comment wrong? The Caprice and Camaro were both rear wheel drive the 1988 88 Olds was front wheel drive. We had a 1987 Front drive Olds as well. The front drive did not matter to us so much as having independent rear suspension and rack and pinion steering. My '75 Camaro 350 CID 4BBL 4 Speed certainly was rear wheel drive, the rear tires made these black stripes and squealing sounds sometimes! The other fwd cars from GM were the Chevy Citation, I don't seem to remember the Olds version name right now. Was that it Andy? Are you referring to the X Body? Olds Omega. My wife owned one a V6. The Citation and its cousins where thankfully done before '88, replaced by the Celebrity, Pontiac 6000, Olds Cutlass Ciera and Buick Century. The X-body cars just ended, supplanted by the A-body cars that started a bit later but lasted longer. The bigger cars were a different platform (it may have been related, I don't remember) that had Olds 88, Buick Le Sabre and Pontiac Bonneville. They were much smaller in the late 80s than they had been as rear-driver cars in the early 80s. Oh that's right! I had forgotten about those. It has been a long time. Thanks for helping my memory out there. I had forgotten when those started.